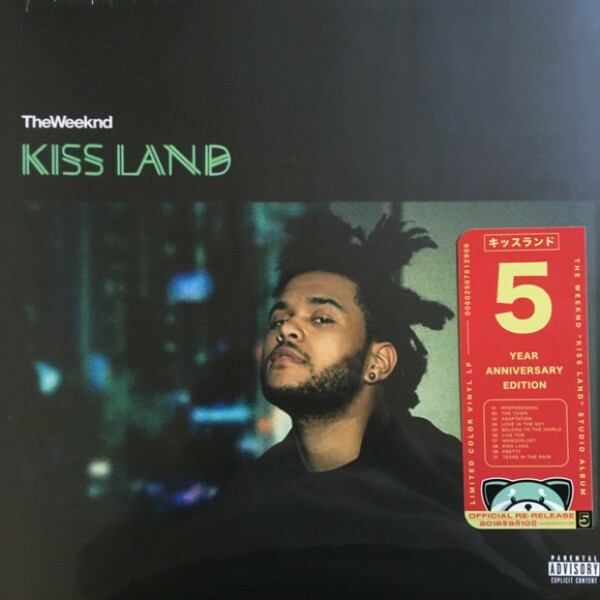 일렉트로닉 뮤직, 힙합, 록이 융합된 PB R&B의 대표 뮤지션 The Weeknd의 2013년 데뷔 앨범 Kiss Land [5 Year Anniversary Edition][Gatefold Cover][Seaglass 2LP]! 2012년 트리플 Mixtapes 합본 앨범 [Trilogy]로 센세이션을 일으켰던 캐나디언 아티스트 The Weeknd는 Pitchfork, The Guardian, NY Times, The Spin, MTV 등 전 세계 유수 미디어를 통해 최고의 평가를 받았으며, Drake, Wiz Khalifa, Juicy J, Ricky Hil, French Montana, Kavinsky, Lorde, Lil Wayne 등과의 작업으로 활동 영역을 넓혔다. DannyBoyStyles, Jason 'DaHeala' Quenneville, Silkky Johnson과 공동작업한 데뷔 앨범에는 Dreamy한 독특한 분위기의 첫 싱글 'Kiss Land', 뮤직비디오 감독 Anthony Mandler가 일본에서 제작한 매력적인 뮤직비디오로 화제를 불러일으켰던 두 번째 싱글 'Belong To The World', 캐나다 최고의 빅스타 Drake가 피처링한 퓨처 R&B 'Live For'등 총 10곡이 수록되어 있다.